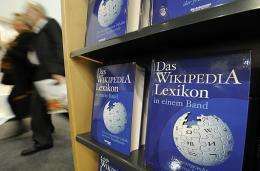 Copies of the "One-Volume Wikipedia Encyclopaedia" are on display at the Frankfurt Book Fair in 2008. More than 50 percent of US adult Internet users look up information on Wikipedia, the online encyclopedia which marks its 10th anniversary on Saturday, according to a new report. More than 50 percent of US adult Internet users look up information on Wikipedia, the online encyclopedia which marks its 10th anniversary on Saturday, according to a new report. A Pew Internet and American Life Project survey found that as of May 2010, 53 percent of adult online Americans consult the user-generated site, up from 36 percent in February 2007. Younger Internet users were more likely to use Wikipedia. Sixty-two percent of Internet users under the age of 30 use the service compared with 33 percent of Internet users aged 65 and older, Pew said. Fifty-two percent of online adults between the ages of 30 and 49 use Wikipedia and 49 percent of those aged 50 to 64. Wikipedia use was highest among Internet users with a college degree, Pew said, with 69 percent saying they use the site compared with 41 percent of online adults with only a high school diploma. Pew said using Wikipedia is more popular than sending instant messages, an activity 47 percent of Internet users engage in, but less popular than using social network sites, something 61 percent of adult Internet users do. The Pew survey of 2,252 adults was conducted in April and May of last year and has a margin of error of plus or minus 2.7 percentage points. Wikipedia founder Jimmy Wales launched the site on January 15, 2001. I hope that's not where they get their "information" on Global Whatever It's Called Today, because the "editor" who took over complete control of the writing, rewriting and/or deleting of every page on the subject was William Connolley, a known AGW fanatic. He personally scrubbed every one of the over 5,000 relevant pages of everything not totally 100% supportive of the Warmist religion. He banned anyone who tried to edit the pages with anything even remotely skeptical on this editable-by-everyone site, and was finally suspended and relieved of all his authority by wikipedia because of it. However, to my knowledge, all of those pages have been left intact with his propaganda on them. But don't worry, because the debate is over anyway, so why do we need anything critical of the dogma? It'd just be heresy. Yep, and facts don't matter a bit do they? Sounds like you're the one with a religion guy. Oh, gosh, you certainly "refudiated" what I said about the bias of wikipedia towards Warmism with that fact-filled rebuttal. I feel so utterly demolished. Don't worry though. The usual acolytes of the Religion of AGW will be here soon to back you up with similar evidence laden comments. Then tell us what your stance is in the debate so we can have a conversation about it. If you're not trolling, and have an actual opinion on the topic, let's discuss it. I'd be happy to discuss it with people who don't lie. That leaves you out. You'll have to tell me where I lied. As so far, you've simply accused me of it for proving something you don't like. If reality is a lie to you, that's a frightening commentary on your common sense. I already told you exactly where you lied, and you "proved" nothing. Stuff it. That's a sign of true intellect jokester.